Pasta and cream – oh you are so yummy but oh so bad for me. Honestly any kind of carb covered in any kind of cheesy or creamy sauce is something I can get on board with, but know I should limit. So what if you add a ton of dark leafy greens and lean white meat chicken to the mix? Still not healthy? Ok fine maybe not healthy but this one pan meal is super satisfying, delicious and not nearly as bad for you as it tastes. A scant 1/2 cup of cream for 4 servings means only 2 tablespoons of cream per person, which is the smae amount you probably sloshed into your morning coffee anyway. My mom passed this one down to me (though I have taken some creative liberties) and I loved it from the first time she made it for me. 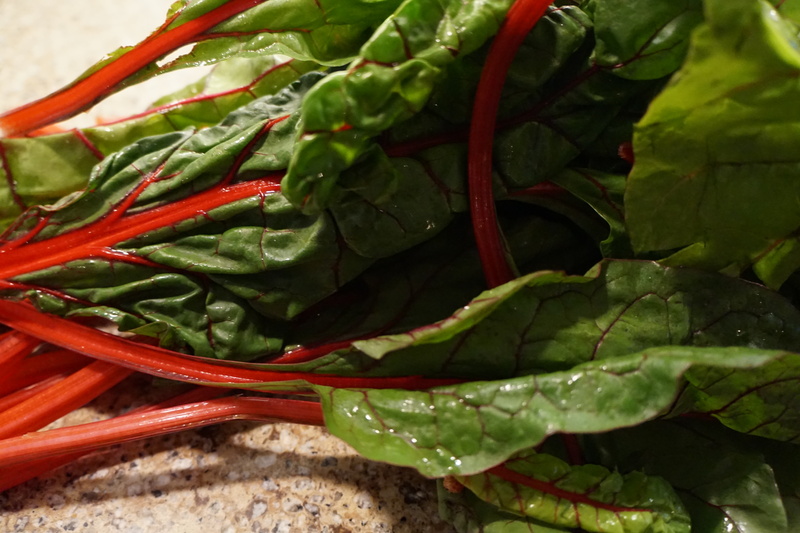 If you have never cooked with swiss chard before it’s that beautiful green you may have seen at the market with the vibrant red or multi colored stalks. Most recipes will tell you to just use the leafy parts and cut out the tougher stems but I love their flavor and the bite they give to this pasta. If you want to mellow them even more you can add the stems first and then the leaves later so you cook them down more. The red from the chard stems also turns the onions pink which is just fabulous in and of its self. The key to chard or really any green is making sure its nice and clean. Grit can easily find its way into greens and the last thing you want to do is chew down on sand when you are eating. Prewashed and bagged greens help with this but for all other greens I really like a salad spinner. It’s an easy way to get them clean and can double as a storage vessel for greens in the fridge. When you come home from the store just wash the greens, run them through the spinner (I have and really like this one) and then keep in the fridge, they will last a lot longer and be ready to use when you want them. For this and most recipes where you want to wilt down greens I also like to leave just a little water still clinging to the leaves – this will help create some steam in the pan and move along the wilting process. This is a really fast dinner, made more substantial by the addition of chicken but it could easily fill vegetarian folks up without. And the smell of the onions cooking in butter…mmmmm so good. Heat 2 tablespoons of butter over medium heat in a skillet. While butter is melting also bring a pot of water to boil for pasta and cook the pasta while making the sauce. When the butter is melted add the onion and cook for 3 to 4 minutes until the onions are translucent. 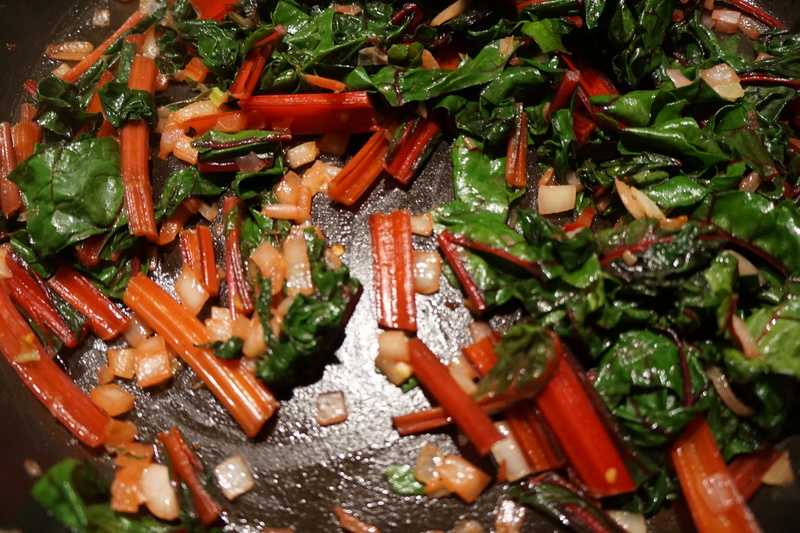 Start adding the swiss chard in handfuls, tossing with tongs if necessary to wilt the greens and get them all to fit. Season with salt and pepper. Cook the chard down until wilted, about 5 minutes, then throw in the white wine and allow it to all cook out, about 2 to 3 minutes. When the pasta is ready toss it in the pan along with the red pepper flakes, the nutmeg and cream (and chicken if including it). Toss the pasta and sauce together and let cook together for a couple of minutes more allowing the cream to coat the pasta and the flavors to meld. Heat 2 tablespoons of butter over medium heat in a skillet. While butter is melting also bring a pot of water to boil for pasta and cook pasta while making the sauce. When the butter is melted add the onion and cook for 3 to 4 minutes until the onions are translucent. 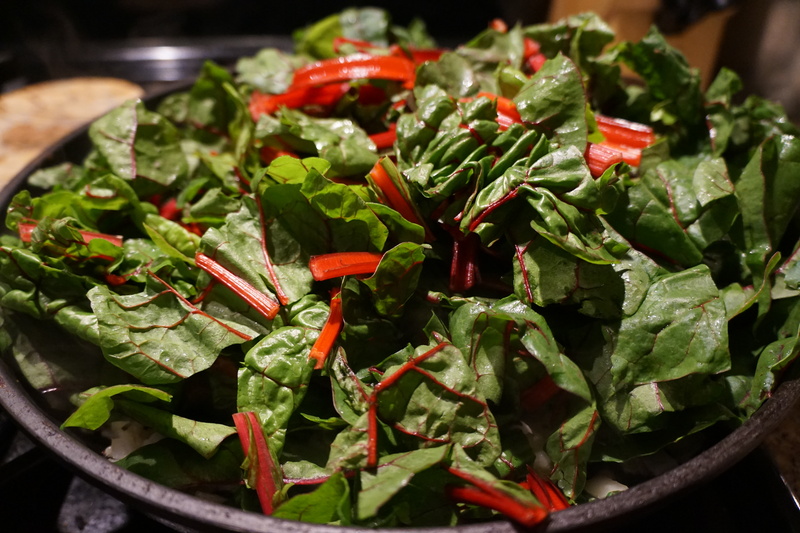 Start adding the swiss chard in handfuls, tossing with tongs if necessary to wilt the greens and get them all to fit. Season with salt and pepper. Cook the chard down until wilted, about 5 minutes, then throw in the white wine and allow it to all cook out, about 2 to 3 minutes. When the pasta is ready toss it in the pan along with the red pepper flakes, the nutmeg and cream (and chicken if including it). Toss the pasta and sauce together and let cook together for a couple of minutes more allowing the cream to coat the pasta and the flavors to meld.